I mean, this Thai Lemongrass Chicken is not even close to a salad, but yet it’s so beyond colorful. I LOVE it! I love color in the dead of colorless winter. Oddly, I also love winter white, but not when it comes to my food. Ok wait, I take that back, give me white cheese + carbs and I’d be pretty happy. Monday though, Monday needs color! Healthy, colorful and EASY, but I think we had the easy recipes discussion last Monday. Let me tell you how I procrastinate, because right now, after writing all day long, that’s pretty much all I want to do. First, I totally check social media. Snapchat and Instagram are my go-to’s. If nothing there is interesting, I float off and check my emails. I know, that’s so fun, right? Well, I look at the junk emails, you know, the ones I should really un-subscribe from. Some of those junky emails can lead me to all the celebrity gossip, which yes, I secretly kind of love. I try not to admit it, but it’s true. Sometimes the mind just needs to be taken away from serious thoughts and on to brainless material, you know? Today for example, I was checking some things on my YouTube Channel and saw the video for Selena Gomez’s new music video. I can’t say I’m a serious Selena Gomez fan, but yet I still watched the video. Weirdly that video somehow lead me to the new Fuller House trailer. I was just all kinds of happy after that… can’t wait for that series to start on Netflix! And now that I got that all out of my system I can tell you all about this Thai lemongrass chicken braised in coconut milk and how much I stickin LOVE it. First, let me explain about the whole chicken in milk thing. I’m sure you guys are probably familiar with Jamie Oliver, right? If you aren’t head here and prepare to be amazed. He does incredibly delicious things with food. One of them is braising a whole chicken in milk. I’ve been seeing this recipe around the internet for the last year and telling myself I have to try it soon. Well, me being me, I have still yet to try that exact recipe. I really had every intention to, but then me being me, I kept thinking about it. 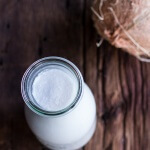 You all know I have a serious love for coconut milk, so when the thought of swapping the cow’s milk for coconut milk popped into my head, there was really no looking back from there, I just had to explore the idea. For a while I wasn’t that sure about it, but then the day finally came to actually test the recipe. I knew from the moment the coconut milk hit the chicken that it was going to be SO good. There are almost not even words to describe the deliciousness, but then of course… you know I have some. Instead of using a whole chicken I kept things simple and went for skin-on, bone-in chicken thighs. You can certainly use chicken breasts too, but lately I am loving all the flavor the thighs give. 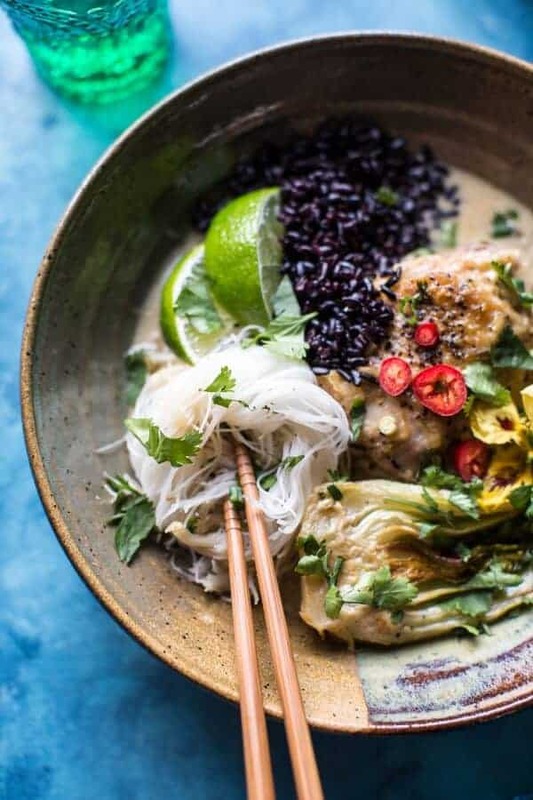 You must use canned coconut milk for this chicken, as the refrigerated varieties are not nearly thick enough. Lite canned coconut milk works, but I prefer full-fat and all its yumminess. The whole meal is made in one pot in about an hour. It could not be simpler. It’s full of lite Thai flavors, moist and tender chicken and my favorite green at the moment, bok choy. There’s also large amounts of lemongrass, ginger and lime. 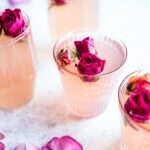 YESSS – take that all you winter colds! Also, I could not decide between black rice (aka forbidden rice) and rice noodles, so I did what I do best. I decided not to choose and just used both. A little noodles with my rice, chicken and coconut broth please. Obviously you do not HAVE to use both, but I cannot deny that both where equally delicious and I was super happy with the combo. Like party in my stomach happy. Man, I think I get cheesier with every passing day. Oh well, it’s food, to me there is no other way of explaining it! I also have to mention that this dinner was a hit with all. Well, not the two pickiest brothers Kai and Red… and certainly not Creighton because he was not here, but everyone else that was in my parent’s house at the time (friends included) fell hard for this chicken. I even got an “I think this is my favorite recipe yet” statement. So you see, this is what a really, really awesome chicken dinner looks like. And yes, I do think it’s all because of the coconut milk. It keeps the chicken moist and makes for THE BEST creamy broth/sauce that chicken can be paired with! Bold statement, but true. 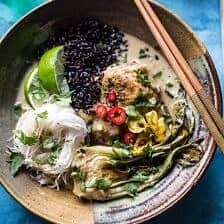 *Adapted from [The Kitchn | http://www.thekitchn.com/recipe-chicken-in-coconut-milk-with-lemongrass-recipes-from-the-kitchn-81026]. Now if you will excuse me, I need some one-on-one time with that bowl there… it’s calling my name. i tried that braised chicken in milk recipe, and it just tasted like normal chicken. not bad, but definitely not as OH MY GOODNESS THIS IS SACRED CHICKEN like a lot of people were saying. this one sounds so much tastier, what with the coconut milk (so much creamier than normal milk!) and aromatics. 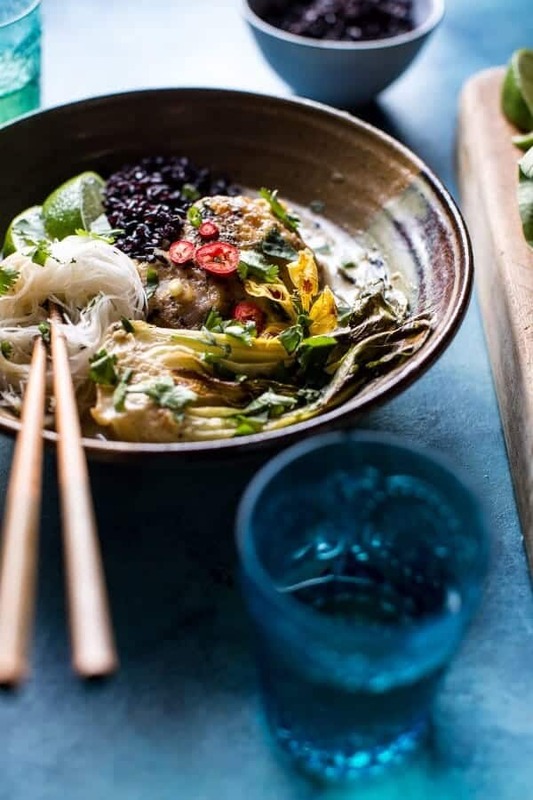 I love Thai food, and this looks and sounds so, so delicious. I also like the way your foods look on the plate. Such great eye appeal! I’ll make this very soon. Hmmmm this sounds just like the kind of thing I like to eat!! 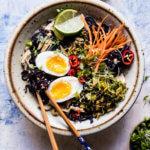 Never tried black rice, I’ve been experimenting with red rice but at the store was quite undecided on which one to bring, red won!! Do you have a vegetarian option please ? HI! I think lentils would be amazing in this. Just add maybe around 1 to 1/2 cups of uncooked lentils and let them cook in the coconut milk as directed. Do not sear them on the stover or anything though. Let me know if you have questions. Thanks!! Thanks for another awesome recipe. 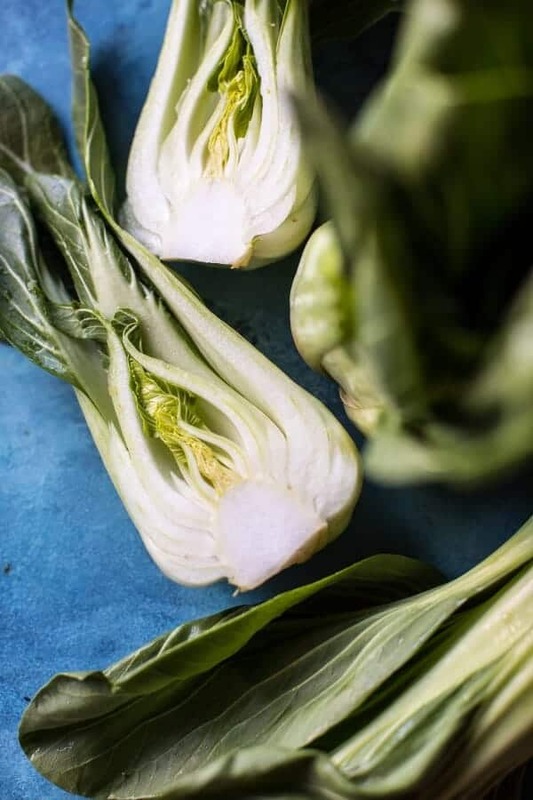 I was wondering if I can substitute baby bok choy with any other veggie? Do you have any ideas? HI! You can use kale, swiss chard or spinach. All will be great! Thanks!! Total yumness! 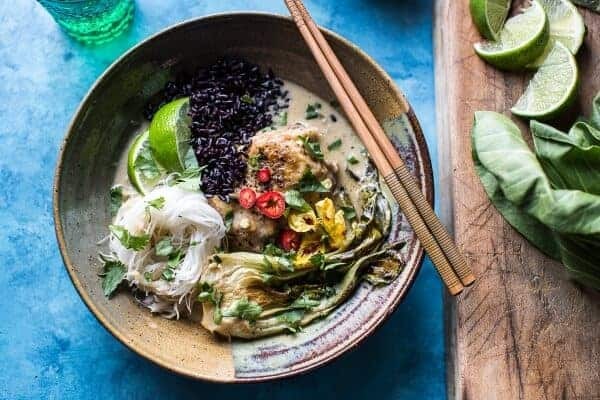 I am such an addict to using coconut milk in everything so this is right up my alley and I just found some lemongrass that I’ve been dying to use, perfect! This is something I feel I could totally get on board with. Now I just need to persuade the rest of the family! 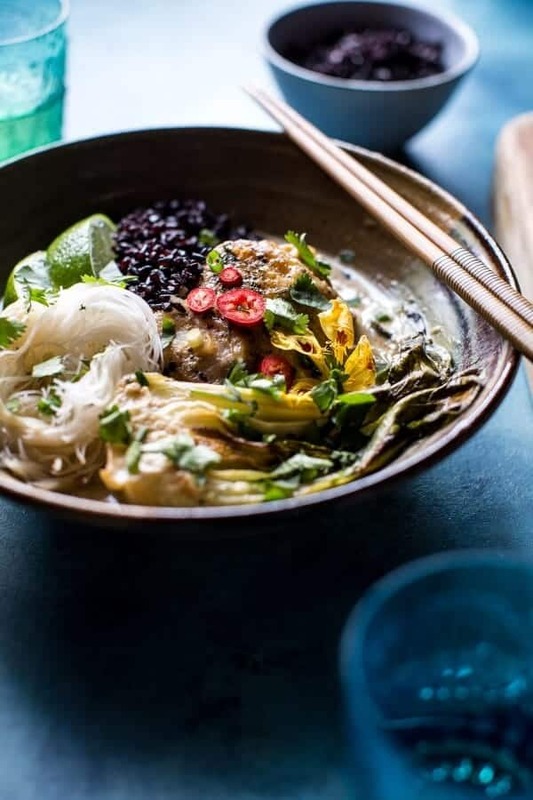 I adore thai food and this just looks mouth-watering! 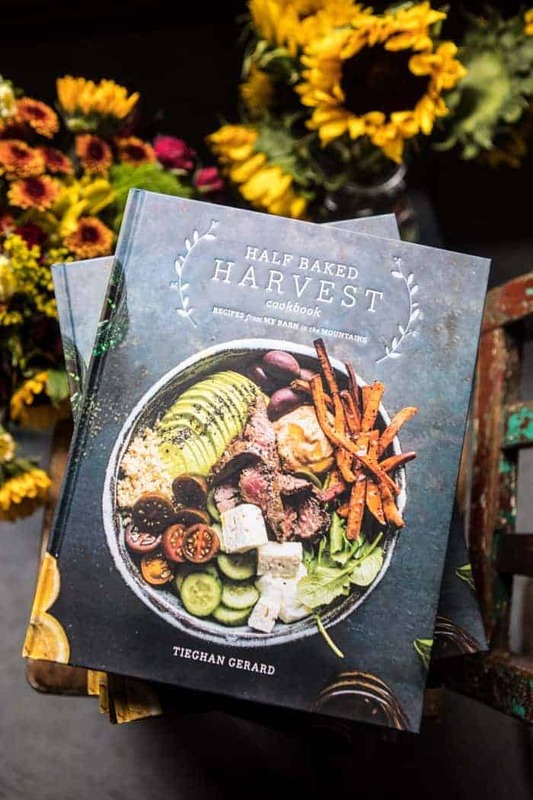 Oh my word… this looks delicious Tieghan! 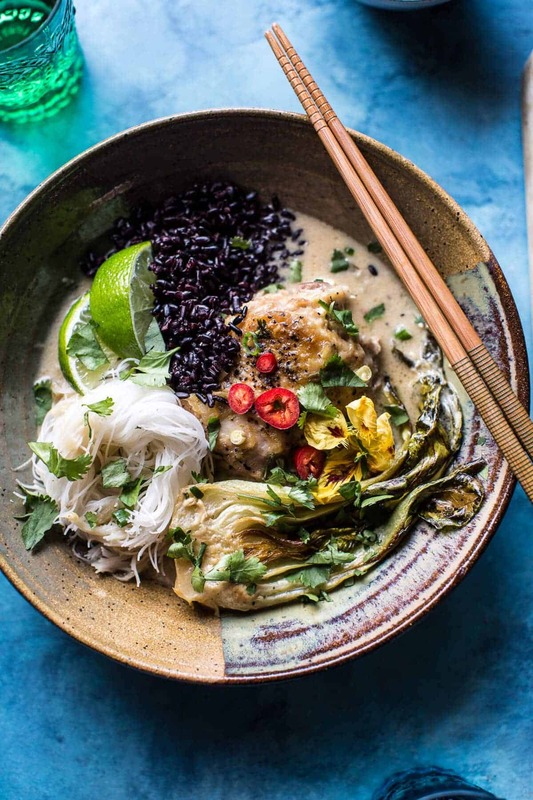 Love the combo of ingredients in this (coconut milk, jalapeño, lemongrass….and cinnamon)!!! Looks amazing!! Looks amazing. Quick question–when you put this in the oven, are you covering the pot with a lid? HI! No, leave the lid off. Hope you love this and thanks!! This looks so awesome! I adore Thai food. Coconut milk with spicy chilies has got to be one of the best flavor combos in the world! The lemongrass stalks is where I have the problem. I’ve used them before, however they are not available where I live now. I have seen lemongrass paste in a tube though. I know it can be quite strong. Have you used the paste? If so how much do you think I should add? I think it would be OK to add more later if there’s not enough, but if you knew that would be great! I have used the paste. I would use 1 teaspoon and got up from there according to your taste. Let me know if you have any other questions. Thanks!! This looks so tasty! Love your photos as always. I don’t have Netflix so I may have to watch Fuller House with my sister. I totally teared up watching the trailer. Full House IS my childhood, basically. 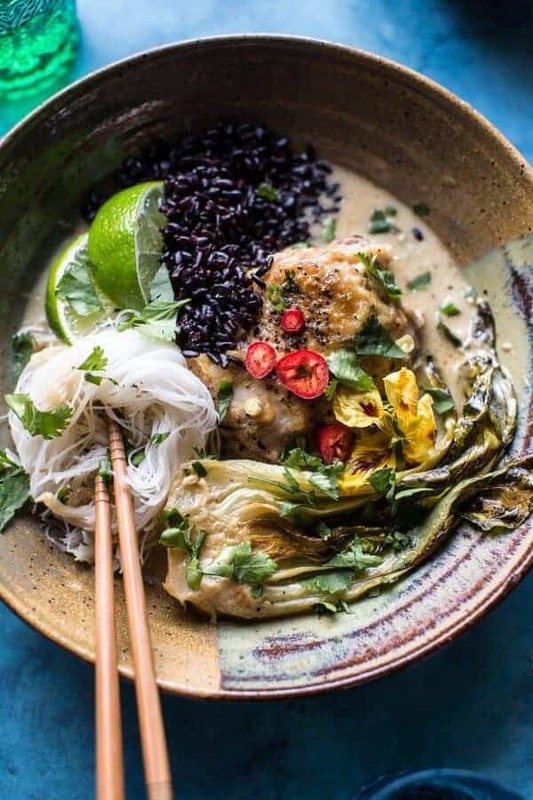 Gorgeous bowl, the coconut milk and chicken combo sounds divine!! Ooh, I am totally going to try a no-chicken version of this! Maybe tofu or lentils or something. The sauce would be amazing on just about anything. Oh yuM! I am sure either will be delish! Thanks! 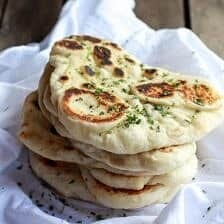 I’m new around here.so , hello Tieghan.Sorry for my English…but i hope it wont be a problem to express my satisfaction with this recipe. I’ve just made it and it’s incredibly good. Fantastic. But really…Thank you so much for everything you are doing. 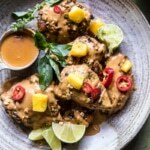 I love thai flavours and this chicken sounds divine! I totally hear you – it’s so hard to stay focussed when there are so many distractions online. The internet is my best friend/worst enemy. This sounds delicious! I, too, have a lot of difficulty keeping on-task when I’m on the computer. I mean, I switched between your post and a Washington Post article until I’d finished reading this. 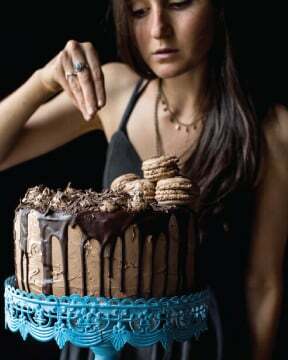 I’m going to have to try to make this sometime soon, tbh, because it’s calling my name. On another note…this recipe, that bowl. Perfect. Once again, girl. Wish I was eating this RIGHT now! Oh, the colors today are just gorgeous Tieghan! This dish looks AND sounds wonderful! Tieghan this is so colorful and looks so flavorful, I love it! Just what this gray dreary month needs! this looks fantastic!! Thank you for that inspiration. I love Thai food, these flavors are the best! I made this last night and it was really. I served with riced cauliflower for a low-carb version. I wish the sauce had been a little thicker. Nest time, I’ll make sure I have cornstarch. Hey Amy, If you want a thicker sauce, just let it cook a little longer (maybe 20-25 minutes?) OR use 1/2 cup less coconut milk. It should thicken in the oven. Thanks! Hi Tieghan! I made this Friday during Snowmaggedon (we didn’t loose power…yay!) and it was amazing!! Loved the flavor combo and it was really very easy to make. The only negative was the lemongrass. This is the first time I have used it so I wasn’t sure what to expect. They were really tough and woody. I ended up trying to fish them out of the bowls. Was I supposed to remove them before serving or should they have been softer after cooking? This dish was so good, my husband asked me to make it again! So lemongrass is woody and should be chopped very thin. Did you leave the pieces a little bigger possibly? Sorry, I should mention this in the recipe and I will edit it. SO happy you loved it and did not lose power! YAY!! I made this a few days ago and my family really enjoyed it. The flavors were wonderful and it was perfect with the side of black rice. Thanks for the great recipe! So happy you all loved it! Thanks! I made this for my boyfriend’s birthday dinner on Friday and we both LOVED it. Thanks for the great recipe! Hi, total amateur at cooking here. 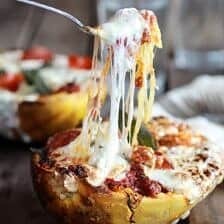 Was curious if it’s possible to make this recipe with a crock pot as opposed to an oven at the same time (medium heat)? This will work great in the crockpot, but I would cook it on low for 6-8 hour or high for 5-6. Let me know if you have any other questions. Thank you! This looks amazing and simple. I have been experimenting cooking a lot of Thai food of late and love the flavor of coconut milk. Seriously you are my new favorite food blogger. You have mad skill. I am a Mom of four young kids and so far have they devoured all of your recipes that I have attempted. Thank you for providing delicious recipes that are healthy and unique. I just cooked this today and it was a hit. Chili, fresh ginger, lemongrass, coconut and coriander are some of my favourite ingredients, so this was right up my alley!! I cooked it for 55mins, only used the rice vermicelli and used sweetheart cabbage instead of baby bok choi and it worked really well. A few thing to watch out for: my oven dish was on the small side which meant when I sprinkled the cilantro/coriander on top it wasn’t in the sauce and got burnt so will need to make sure that everything is submerged by the coconut milk next time. I might just sprinkle it fresh after cooking next time and include a little bit of ground coriander in the sauce. I might also add a little more ginger. I can’t wait to make this again; many thanks for sharing this recipe. I will be sure to check out some of your other ones. I am so happy it went great for you Marie! Thank you so much! 3 to 31/2 cups of Coconut milk or total 6 1/2 cups? Hi! It is 3 to 31/2 cups of Coconut milk. Sorry for any confusion. Hope you love this! 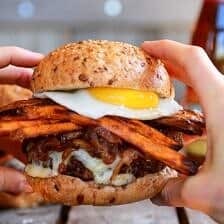 This looks amazing, and I’m getting ready to try it! I have a question, before I do. When putting my Dutch oven into the oven, is it with or without a lid? 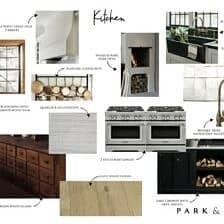 Is it possible to do this recipe on the stove top? I don’t have a dutch oven. 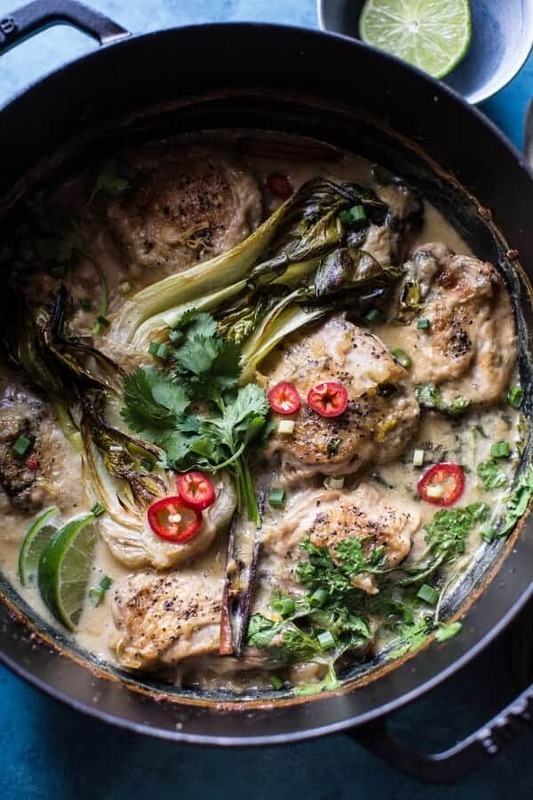 Is it ok to have the braised chicken sit in the coconut milk and marinate? Last minute question since I’m making this tonight — do you think this would work well in the instant pot? I’m thinking saute as usual, pressure cook the chicken for about 18 minutes, add the bok choy and cook for another 2. What are your thoughts?